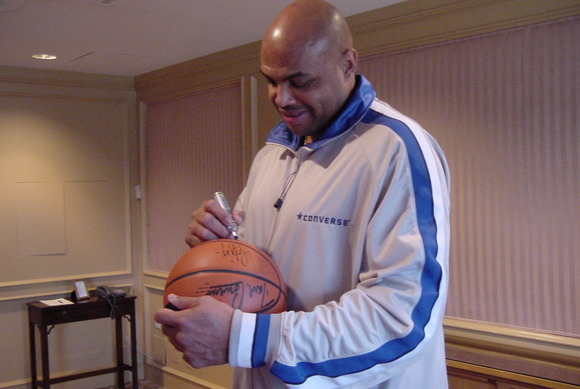 Here is the big reveal...My job this week was to go to Atlanta, GA and do a basketball signing with Charles Barkley. I'm NOT a sports nut, but I am married to a man who has been involved in the sports industry for many, many years. So it has just been a part of my life. I'm also NOT one to be star struck. Even today I simply saw a man...a big man (lol), but just a man. My dh has been trying to get his signature on these basketballs for at least 7 years. My dh has been working on this project for over 11 years, so today I was excited just to be one step closer to the completion of a long project journey. So, today at 2PM in Atlanta, GA at the Ritz Carlton, Faith and I did the signing. C. Barkley was a gentleman and completed everything quickly.